Mammy’s Boys are back in town…”THAT’S NICE”! Get ready for an uproarious night on the lash with the mother of all comedy–Mrs Agnes Brown. Agnes and Winnie are spending a quiet night in Foley’s bar, waiting for Agnes’ children to return from a trip to Spain. When Dermot, Rory, Mark and Cathy arrive, they come with surprising news about their late father. An outrageous evening full of surprises and belly laughs, featuring all your favourite characters from the hit sitcom, as Buster himself might say, “You’d have to be eejit to miss it”. 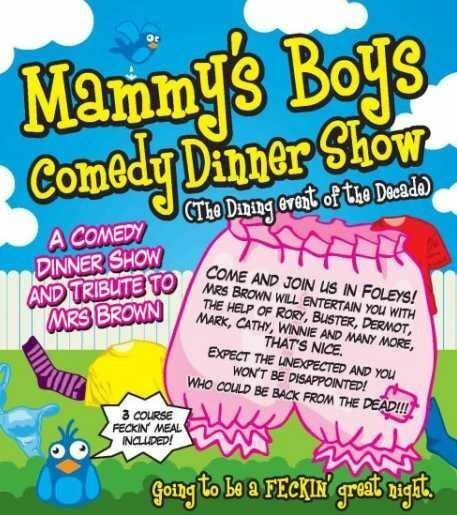 Come and join us for a comedy dinner show and a tribute to Mrs Brown. Don’t miss out on an evening of fun and entertainment with 3 course meal included! Check out the menu here.